Leave Renegade and head towards Epping Rd via Rosenthal Ave, Birdman Ave and Longueville Rd. Turn right on to Epping Rd and then turn left on the Pacific Highway. Follow the Pacific Highway through Chatswood, Roseville, Lindfield, Killara and Gordon. At the Mona Vale Rd intersection turn right. Follow Mona Vale Rd through St Ives and into Terry Hills. At Terry Hills, turn left onto McCarrs Creek Rd. Follow McCarrs Creek Rd past the first Akuna Bay turn off, and descend down the hill to West Head Rd, take this left and head up the hill. At the intersection with Coal and Candle Dr, veer right to remain on West Head Rd. 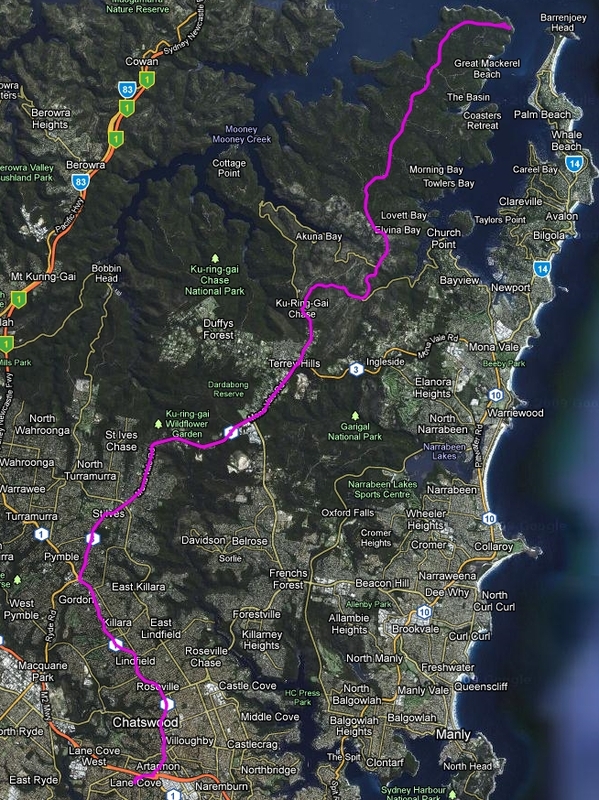 Follow West Head Rd through Ku-Ring-Gai Chase National Park to the Rest Area on the Head Land for a break. Leave the Rest Area and return along West Head Rd, follow this to McCarrs Creek Rd, turn right and head up the hill. Regroup at the Thai Restaurant before heading back to Renegade. At the McCarrs Creek Rd and Mona Vale Rd intersection, turn right and follow Mona Vale Rd back through St Ives to the intersection with the Pacific Hwy. Turn left on the Pacific Highway, and follow it back through Gordon, Killara, Lindfield, Roseville and Chatswood. At the Epping Rd intersection, turn right and then turn left onto Longueville Rd, take the first right into Birdwood Ave, and follow this back to Burns Bay Rd, Renegade and the Cafe. This used to be an A Group ride, however, the surface out to West Head has been resurfaced, and as a result, it is now a B Group ride. This is one of the most spectacular views within Sydney with it's stunning vista encompassing Barrenjoey Head, Lion Island and some of the Southern towns of the Central Coast. After leaving Renegade, the group will head up the Pacific Highway as so many of their rides do, at Mona Vale Rd, they will turn right and then ascend the hill that Mona Vale Rd welcomes you with. If the group has splintered on this climb, they will pull into the Caltex Service Station just past the Cowan Rd intersection for a brief regroup. If there are only small gaps in the bunch the front runners may just ease up to bring the group back together. Just after the Richmond Rd intersection, there is a short descent followed by a short climb. On the approach to this descent, the group will claim the left hand lane due to rubbish and overhanging branches in the shoulder. After this descent, there is a climb out the other side, it is only short and the group will often take it easy to allow those who aren't mountain goats to rejoin once over the top. The rest of the tip along Mona Vale Rd is pretty stock standard, there is a good shoulder with virtually no hills, expect a decent pace along here. On turning into Terry Hills, the group may stop briefly at the Thai Restaurant if it is hot to top up water bottles as this is the last tap of drinkable water. Otherwise, they will keep riding along McCarrs Creek Rd. This section is often quite fast as it is slightly down hill. The Akuna Bay turn off flags the start of the descent down McCarrs Creek Rd. This is a fast descent with some really nice corners, like all descents, it can be treacherous in the wet, but due to the rock at the side of the road, and the overhanging trees, it is possible for the road to stay wet for longer after rain. Watch out of the left hand turn on to West Head Rd, this is about half way down the descent. It is not far past the bridge over Fern Tree Gully Creek. Ascend up West Head Rd, and stop at the top of the hill to bring the group back together. From this point, it is about 11km out to West Head, and then 11km back out again. Because this road only leads to West Head there isn't a lot of traffic, except for cyclists. Expect to see a lot of cyclists on this road. After descending into the Park, you will quickly realise why this ride is challenging. Prior to the resurfacing, the road was very dead, it is now some very smooth Hot Mix that is a pleasure to ride along. Even so, the road undulates the whole way which does add to the challenge, most of the climbs are only 500m or so, and aren't particularly steep but if you start them in the wrong gear, it can still be hard. Some of the stronger riders may forge ahead here, there is no expectation to stay with them, so you can push yourself and try and stay with them for as long as possible, or just enjoy the ride at a more comfortable pace. They will wait at the end of the road for everyone. After about 9-10km, you will turn a sweeping right hand corner and be facing The Wall. At this point, don't give up. You are about 1,500m from the end of the ride. This hill looks vertical at first, and while it is steep, it isn't very long, once over this, there is a second shorter climb and then a brief descent to finish the ride. When the road splits, the road also does increase it's downward gradient. Be careful here as there is a right hand corner at the bottom. It has a recommended speed of 35km/hr, and until you are familiar with it, it is advised to keep close to this speed. It looks fairly benign, but it sharpens up and if you go in too fast, you will quickly run out of road. Once past this corner, pull into the Rest Area for a bite to eat, something to drink and enjoy the view. Keep an eye open for some of the wildlife, Wallabies and Monitor Lizards have been seen here on a regular basis. Because of the nice spot, you can expect the group to hang about for 15-20 minutes on a nice day. After leaving the Rest Area, you will have to contend with a short climb on cold legs, expect everyone to whinge about this one. The return leg will be played out similar to the way in. Again expect some of the stronger riders to push the pace. 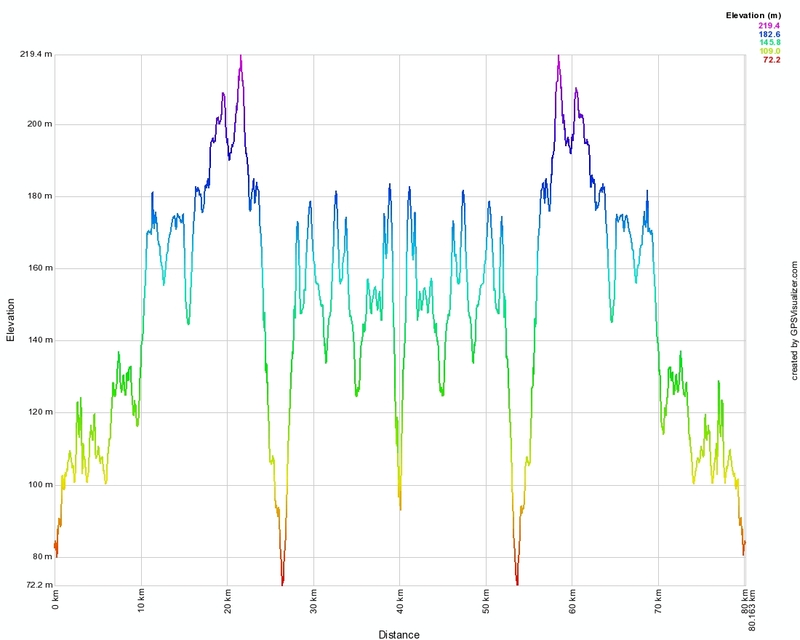 Again, don't be too concerned if you want to ride at a more relaxed pace. Towards the end of the park, there is one last small hill to contend with. The group will reform at the top of this climb, or if it is large, at the bottom where the road splits to Akuna Bay or back to McCarrs Creek Rd. The descent back down to McCarrs Creek Rd is another fast fun descent where you can easily sit in the fifties the whole way down. At the bottom watch out for traffic as you turn right onto McCarrs Creek Rd. Once the group has reformed at the Thai Restaurant, they will head back along Mona Vale Rd, as this is slightly downhill, expect a reasonable pace, but as always in the busier areas, the group will be kept together, as always when riding along Mona Vale Rd, watch out for the short climb back up to St Ives. After that, there is the heavier traffic to contend with through St Ives, and then the fast descent down to the Pacific Highway. At this point there is a mere 10km along the Highway before enjoying your much deserved coffee at the Cafe.